I'm doing a little happy dance for Kristin over at My Uncommon Slice of Suburbia! Have you seen her kitchen??? Really, if you have not...you have to. Right.now! I'm even giving you a little preview below...but you can get all the details on her blog. I was going from blog to blog a few months ago, and stumbled on her kitchen redo...and about fell off my chair. I could not believe the kitchen she has now started out so 'builder basic'. Since then her blog has become one of my favorites, I am always checking in to see what she is up to. The space was done on a budget...and was totally DIY...well, she had a little help from a painter friend, but who can blame her! 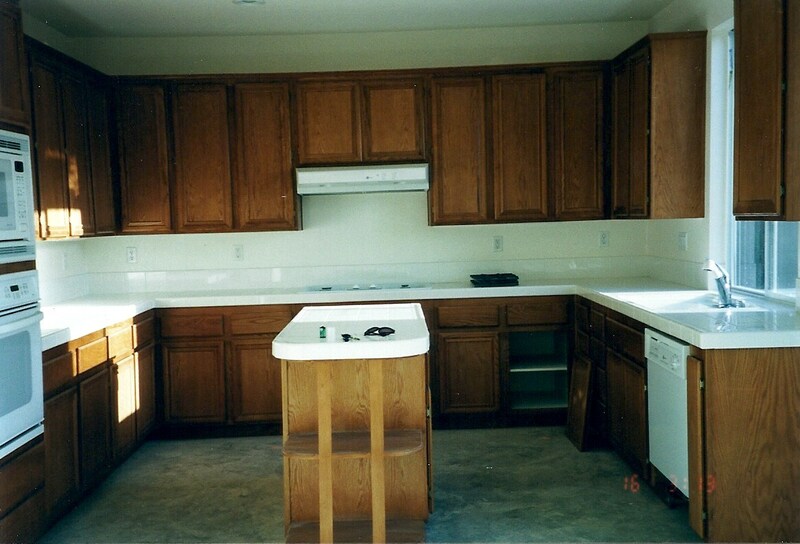 Look at all those cabinets! It took a little time, as all good DIY projects seem to. But, she did it a step at a time and the space has evolved into an elegant, comfortable space. And she didn't get new cabinets...nope...she used what she had an made them better. Seriously, Kristin had a vision...and it was perfectly executed. I have seen a good make-over or two, but the change in this one is fantastic! It is so bright...and is it just me...or does it seem about 10x bigger than it started out?? I am loving her floor...and the big window above the sink is fabulous! On her blog, she even shows step by step how she created that gorgeous island! And the part that I find more wonderful than the kitchen is that she was lucky enough to have one of the editors from Better Homes & Gardens find her blog and fall in love with her kitchen like I did! That would be the best job ever!...to sit at my desk and blog-hop all day looking for rooms that make me swoon. Congrats, Kristin. I am glad your hard work is going to be shown off for the world to see! that's incredible! it is gorgeous. Great makeover! No wonder she is being published. And it is inspiring that she did it step by step on a budget. I have to check out her blog now. Thanks for telling us all about it, Mary! You are so sweet to feature me like this! I really feel so honored at all the wonderful things you had to say! Hope you are having a wonderful day and thank you so much! What a transformation! I love how it turned out. I'm heading over to visit Kristin's blog now. So pleased to have found your lovely blog. you friend's kitchen is great but there's alot more I like too! The chandeliers and especially the junk store finds, just the sort of thing I do here in France. I know I'll be coming back for another longer look. oh my that is an AMAZING transformation! Well done to your friend to make it to a magazine!! Kristin's kitchen is so beautiful. I love DIYers. So much inspiration. And oh so lovely. I will have to go over and see her blog. I love it! I love white cabinets and I love that she didn't buy new. Great DIY example! She did an awesome job. It's truly beautiful. Kristen does beautiful work. Her blog button is on my page and I visit her 1-2 a day. I love her ideas and the way she shows her readers how to get there. This is my dream kitchen! what youre talking about, why waste your intelligence on just posting videos to your weblog when you could be giving us something enlightening to read? this web page and be updated with the most recent news update posted here. sites I stumbleupon on a daily basis. It's always exciting to read content from other authors and practice something from other web sites. Can you tell me the dimentions of you kitchen...looking for the width...cabinent door to cabinent door to see if I could fit an island like you have in my kitchen. & many of the most humanitarian in most of military history. live streaming is really a important element with the upcoming gaming consoles as well. Murray - Las Vegas, Nevada (Magician) - he didn't obtain the credit he deserved. mission objectives with no them freeze to death. Do You Long For The Convenience And Practicality Of A Bluetooth Helmet. which is scheduled to become the past expansion inside trilogy. parents. The question we have to ask is the reason why are available so few superstars. war titles have generated their unique following. But I am sure they will sort any problems out before its Facebook's solar cruisers launch. government hands. Originally, Relic Entertainment announced they could be releasing Company of Heroes 2 on the beginning of 2013.
setbacks because you learn – that's just part in the process. For example players discuss not seeing sugar in ages or how you can find not enough weapons to go around and are made to simply head towards the enemy and salvage the things they can on the battlefield. your busy professional and work force. flea market weekend - woohoo! !